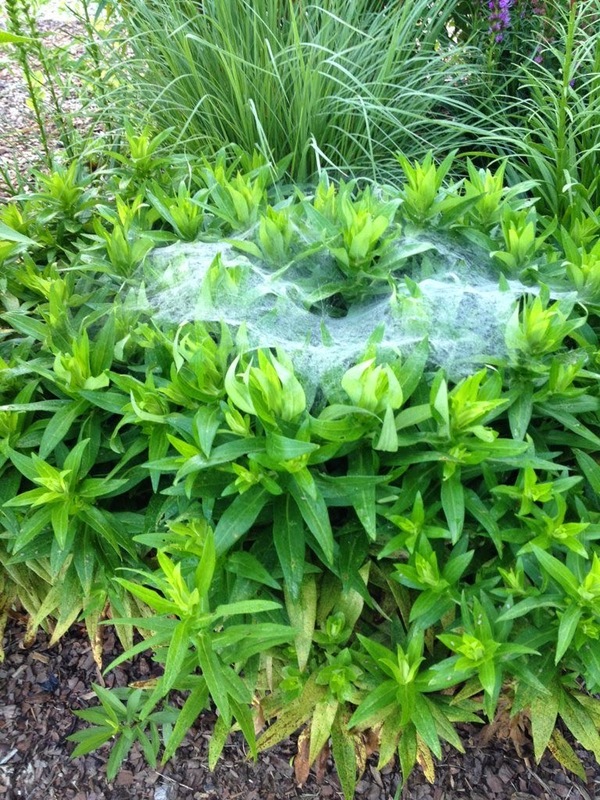 When you go out and walk around your garden in the early morning hours, as every gardener should, you may see bits of fairy lace laid out to dry on the tops of shrubs, across the lawn, or even among the stems of perennials, as shown here. Rather than being disgusted by the careless nature of the garden fairies - leaving their fairy lace lying around where anyone could take it - you should be grateful the garden fairies feel so at home in your garden, they will leave their fairy lace wherever they left it to dry, without a second thought. Fairy lace often disappears later in the day, most likely retrieved by the more industrious fairies who bustle about during the day tidying up after others, fussing the whole time about those who made the mess, but secretly happy in their work. For what good is a tidy garden, for those who enjoy the process of cleaning it up? Yes, dear gardener, when you encounter bits of fairy lace strewn about the garden in the early dawn hours, leave them where they are, and be happy the garden fairies feel so at home in your garden. I must apologize, the faeries from my backyard must have migrated and are spreading bad habits. A couple of years ago I got this picture early one morning before heading off to work. Those fairies have been busy. I love seeing all the different types of lace about the garden. You know there will be a big lace convention right before fall as that is when I see most of it. Oh dear, I must have displeased the Garden fairies as they never ever leave their lace in my garden!